So you are planning a short trip to Japan but you don't want to invest in a pre-paid phone and a contract is out of the question? Never fear, there is another way (two, in fact)- the Japanese rent-a-phone, and overseas roaming. There are two basic types of rental services: rental SIMs and rental handsets. The former is simply a SIM card that you borrow and stick in your W-CDMA enabled phone. This option requires that you have a phone that is compatible with Japanese frequencies (2.1ghz) which includes most non-North American phones. North American users (Mexico, Canada, USA, etc) must make sure they use a phone that is compatible with this bandwidth as opposed to the non-standard frequency used in that area of the world (usually 1.9ghz). Consult your phone manual. Also keep in mind that unless you handset is Japanese then you may not be able to use many services like text and mail. Rental handsets are simply a phone and SIM package that does not require you to bring your own phone. 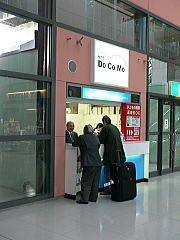 Many of the major phone companies like NTT DoCoMo and Softbank have their own services with counters located at most major international airports. You can pick up an order or sign up the day of arival. There are other third party companies like Rentafone Japan, Cellular Abroad, and Japan Cell Rentals offer services such as blackberry rentals, mobile data rentals, delivery to overseas address, and even sending the kit right to your hotel. The per minute rates, reservation fees, length of contracts, and services available differ widely by company so do you research. Often, companies with higher reservation fees charge less for calls and some companies don't allow for internet and texting unless you pay more cash. For the most part incoming calls are free. One thing that all of the rental phone and SIM services have in common is that they only accept credit cards. Most companies will place a temporary credit hold ranging from 100-300 USD as a short of temporary escrow to make sure you don't skip out on your bill so don't be surprised to find a big chunk of cash taken out of your debit account or credit line, but you can expect to get this back if you behave yourself. An alternative to renting. Many networks around the world have agreements with one or more Japanese service providers to offer service while allowing you to keep your local number active. However, what services are available, cost, and terms all vary widely by carrier. Do your research. The downside to roaming is that it can be very, very expensive. If you have a smart phone make sure to disable the data services overseas because these phones are always checking for e-mails and using data even when they are on stand-by. Well that just about concludes AccessJ's mobile phone super feature. If you have any other mobile phone related topics you would like to see covered don't hesitate to drop a line!